The moist membrane that lines the under surface of the eyelids and covers the "white" part of the eye (up to the circular margin of the cornea) is called the conjunctiva. Any inflammation of this membrane is therefore called conjunctivitis. Here we will describe three varieties of bacteria conjunctivitis. The redness and swelling of the conjunctiva in this form of conjunctivitis is usually more pronounced on the under surfaces of the eyelids than over the "white" part of the eye. Early in the disease there is a watery discharge from between the eyelids. Later the discharge contains more mucus and, in severe cases, a mixture of mucus and pus. The patient complains of scratching, burning, and smarting sensations in the affected eyelids. Because the infection is caused by a germ (anyone of several carried by contaminated fingers, towel, or hand kerchief) both eyes are often involved. Any age group may be affected, but the disease is more common in children and young adults. Often several in the same household or school are affected about the same time, the disease being easily communicated. The course of the disease when not treated is ten to fourteen days. The epidemic form of acute bacterial conjunctivitis is commonly known as "pinkeye." The symptoms are intense. 1. Take all reasonable precautions to keep the infection from being transmitted to other persons. Wash the hands with soap after each contact with the patient's face. Use paper face towels and hand kerchiefs and burn these after use. Bed linen which has come in contact with the patient must be disinfected before it is laundered. 2. Wash you eyes with boric acid solution three time a day to avoid the spreading of infection and reduce the severity of disease. 4. Use rose water drops that will decrease the burning sensation due to inflammation of conjuctiva. 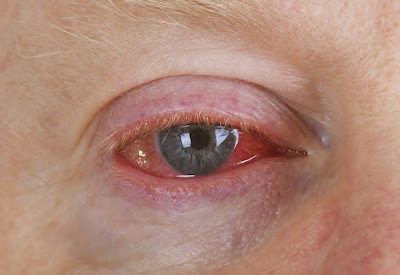 from a neglected case of acute bacterial conjunctivitis, irritation from polluted atmosphere, a poor state of general health, insufficient sleep over a long period of time, indulgence in intoxicating drinks, overuse of the eyes, the need for eyeglasses, chronic inflammation of the tear duct, and allergy. 2. Follow a general health building program including the eating of an adequate diet with sufficient vitamins. 3. Cleanse eyelid margins and lashes at least twice daily with cotton applicators moistened with warm water. 4. Wash you eyes three time a day with boric acid to avoid further spreading of infection.